For centuries, man has been breeding race horses. For the past 104 years, he has been racing them on a 1¼ mile track at Churchill Downs in a race called the Kentucky Derby. This race is sometimes referred to as "the most exciting two minutes in sports" because the winning time is usually very close to 120 seconds. Because of its association with gambling, thoroughbred horse racing may not enjoy as much respect as the breeding programs at prestigious universities. But fruit fly racing isn’t a major American sport, so Drosophila breeding doesn’t attract big bucks from corporate sponsors. On May 2, 1998, Real Quiet made a net profit of $738,800 for his owners in just two minutes and two and one-fifth seconds. Can you name any fruit fly that made nearly three quarters of a million dollars for the breeding scientist last year? We doubt it. This is important because the theory of evolution holds as one of its postulates that there is no limit to how much a species can evolve. Evolutionists say this lack of a limit allowed a dinosaur to evolve into a hummingbird. Creationists claim that species can only evolve within certain limits set by the amount of genetic variability in the critter’s DNA. Whose view is more consistent with the data? This year Charismatic won the Kentucky Derby and Preakness Stakes. There was a possibility that he would win the Belmont Stakes and become a Triple Crown Winner. But he ran so hard that he broke his own leg and lost the Belmont Stakes. Have we reached the point where horses’ muscles are getting so strong that they are too strong for their own bones? Here is a table of the Kentucky Derby winning times (in seconds) for the last 104 years. If you graph this data you can see there has been no noticeable improvement for the last 50 years. The average winning time for all 104 years is 124.3 seconds. In the last 50 years that average decreased to 122.1 seconds. In the 1990’s, the ten winning times varied from 121 seconds to 125 seconds, averaging 122.4 seconds, which is 0.3 seconds slower than the average winning time for the last 50 years. Or, to put it in terms more familiar to American motorists, the average winning speed from 1950 through 1989 was 36.893 mph, and in the last 10 years it has decreased to 36.768 mph. The Kentucky Derby data does not show increasing speed without limit. It shows remarkable consistency, which seems to indicate that the limit may already have been reached. When researching the Kentucky Derby data, we stumbled across this interesting passage in the Thoroughbred Times On-Line Stallion Directory. We can’t help but point out that the only three fillies (young female horses) to have won the Derby were Regret, 1915; Genuine Risk, 1980; and Winning Colors, 1988. None of them went on to win the Triple Crown. Therefore, since all the Triple Crown winners were stallions, if you mate two Triple Crown winners you won’t even get a modest runner. But the point is still valid--offspring do tend toward the genetic mean. but depends on individual traits. a population changes over time. We agree completely with statements 1a through 4a. We don’t know of any creationists who don’t agree with those statements. The only disagreement is with statements 4b though 5b. Specifically, we believe there are limits. 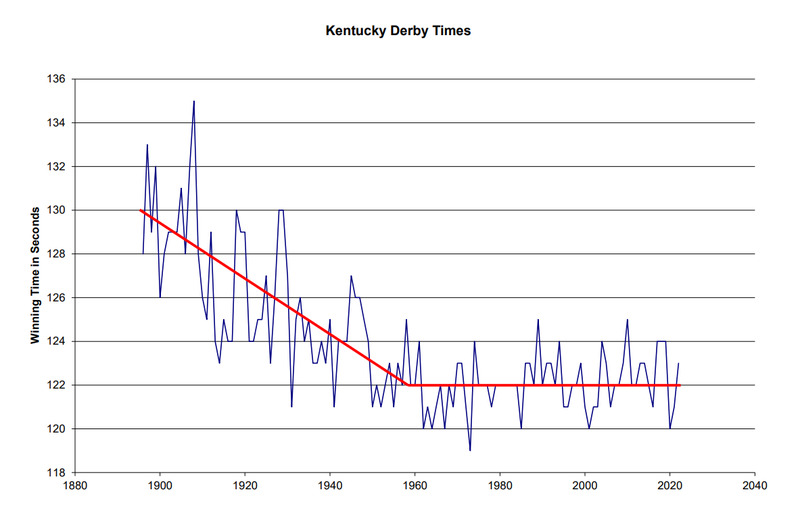 The Kentucky Derby data suggests that there is a limit to how fast horses can run. Statement 4b is false. Statement 5a depends upon statement 4b to be true. The only way all current species can share a single common ancestor is if there are no limits to how much genes can change. If there is a limit to how much a species can evolve, then all current species cannot share a common ancestor. Statement 5b is merely a silly gloss intended to support statement 5a. Similarity of species does not necessarily show common ancestry. The similarities could just as well reflect the preferences of a creator. Geographical distribution of species merely shows that children tend to be born near their mothers. This isn’t a particularly profound statement, and in no way proves evolution. In fact, it would be better proof of evolution if species appeared in places where their parents had never been because that would be evidence that they evolved from something else. For example, if kangaroos suddenly appeared in Nebraska, without any kangaroos being introduced to the state, it would mean that they must have evolved from prairie dogs. We are starting to grow weary of pointing out that the fossil evidence shows abrupt appearance of species, with very little change after their appearance. Unfortunately, statement 5b requires us to say it again. Statement 5 is the issue. Students are being taught that all current species have a common ancestor. They are told this is possible because there is no limit to how much a population can evolve. That’s why this essay is emphasizing that there are limits to biological change. The Kentucky Derby is just one example. Farmers have been trying to breed cows that give more milk. (It’s that money thing again.) Is there a limit to how much milk a cow can give? We believe there is. Do we know what it is? No, we don’t, but we are sure it is less than 1,000 gallons a minute. We are willing to bet it is a whole lot lower than that. Seriously, milk contains about 150 calories per cup. That’s 2,400 calories per gallon. Suppose a cow eats 15,000 calories a day. (We are just guessing. Weight Watchers doesn’t publish any recommended diets for cows.) If she is 100% efficient, a cow can produce 6.25 gallons of milk (which contain a total of 15,000 calories) a day on a 15,000 calorie diet. Of course a cow has to expend some calories to grow muscles, and bone, and keep warm, etc., so she can’t turn 100% of her input energy into milk. No doubt someone at an agricultural college has done a Ph.D. thesis relating diet to milk production and can tell us how efficient modern dairy cows are. We just could not find that thesis. 2 But we are confident that cows can’t violate the law of conservation of energy, and cannot produce energy out of nothing. Therefore, there must be a limit to how much milk a cow can produce. One could make a similar argument about the egg production of chickens. Clearly there are limits to how much an existing characteristic can change. Horses already know how to run. Running is an existing characteristic. There is a limit to how much faster they can run. We believe this because there is evidence from the Kentucky Derby that they have reached the limit. But for evolution to be true, there must not only be no limit to existing characteristics, there must also be no limit to the appearance of entirely new characteristics. According to statement 4b, there is no fundamental reason why horses can’t grow wings and learn to fly. That sounds silly (we hope), and will draw criticism because it is a “creationist caricature”, but it is true. Evolution depends upon the idea that a land mammal evolved into a porpoise, complete with sonar. Evolutionists must also believe that (over some controversial period of time) mice can sprout wings and evolve into bats, complete with sonar. Is it so unreasonable to ask for the slightest bit of scientific proof that that there are no limits to evolution? What is the proof that grain-eating mice can evolve into insect-eating bats that use sonar to fly through dark caves? As far as we can tell, the evolutionists’ reasoning is simply that bats exist. Since bats must have evolved from mice, there must be no limit to how much a species can evolve. Since there is no limit to evolution, mice could have evolved into bats. It is an obviously circular argument, which is why you don’t hear evolutionists present it that way. Yes, we’ve put words in evolutionists’ mouths. That’s because they won’t speak for themselves. What is the proof that there is no limit to how much a population can evolve? There isn’t any. One has to accept, by faith, the doctrine that there are no limits to how much a population can evolve in response to the pressure of selection. Once you accept that doctrine, then one can accept the doctrine that all species share a common (unknown) ancestor. Professional breeders know there are limits because they’ve been pushing those limits as far as they can. If someone could breed a horse that runs the Kentucky Derby in one minute, they would do it. If they could cross a horse with an eagle to produce a flying horse (like Pegasus), they would do it. (Imagine the money maker that would be!) The scientific evidence is that there are limits to the genetic variability of species, which prevent the evolution of entirely new species. Science is against evolution. For an update on this article, please see "California Chrome Proves Us Right". 2 Some time after we wrote this article, we happened to find Tidbits of the Eastern Sierra Nevada", 5 February, 1999. (Their registered service mark is, "All the News You Never Knew that You Never Needed to Know.") This particular issue said, "The average dairy cow produces about 1,600 gallons of milk annually." That works out to almost 4.4 gallons per day, which is 70% efficiency, if our estimate of caloric intake is correct.